Instead of a fake rock project, how about a fake tree project? What we have here is a (possible leopard gecko habitat)structure that could be used for several different creatures. Although the other projects on this website could also be used for animals other than lizards, this one might be more aesthetically appropriate for a number of various critters. A leopard gecko habitat comes to mind -either that of a leopard or a tokay gecko, or many others in the gecko family. Geckos, in general, are very good climbers; and in their natural habitat -trees are quite abundant. This fake tree project would be perfect for a tarantula habitat. A number of different spiders such as the goliath tarantula sometimes make their house out of a tree in the wild. Tarantulas need a "hide" to feel safe when they molt, so providing some sort of cover such as this is beneficial. Of course it goes without saying that this would be ideal for a tree frog habitat. No tree frog would turn its nose up at its very own tree to be a frog in. This miniature tree could also be well suited for a snake habitat. Provided the snake is small enough, or you scale up the tree to be big enough for the snake to curl up in. 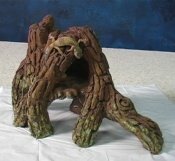 Check out the video below on how to build this potential leopard gecko habitat. Check out this other tree themed project meant for expert climbers. How about a Vietnamese centipede habitat? The list is almost endless as to how many different creatures could enjoy this fake tree project. Some of you might be saying: -why not just go into the woods and find an old stump or something that would do. This of course would be an option, and a lot of people have done this. The benefit of a project like this is you have complete control over it. You have control over the look, and more importantly the exact dimensions -for it to suit your creatures cage. Whatever pet you may have, you want to take into consideration the skill level of its climbing abilities. For example: a bearded dragon might not have the skill level to descend this particular structure without losing its footing. A gecko, on the other hand is much more skilled in all aspects of climbing. The other option is making this structure somewhat short so as not to create a high perch from which a creature could fall. The first thing I did when designing this potential tarantula habitat is estimate how much space inside the fake tree would be needed. If it's for a tree frog habitat -then obviously a larger space is not required (depending on the size of your tree frog). But a small snake habitat might need a larger diameter. Judge by your creature's size, and figure that they'll need to turn around to exit the fake tree. Using polystyrene -I came up with an "oval" roughly 6" x 8" for the base of the tree. I then cut out little rectangles roughly 1 1/2" x 2 1/2". Using these rectangles I built up from the bottom into what looked like a little igloo. I bonded these pieces with a product such as liquid nails. I then figured I wanted the base of the fake tree 6 inches above ground level. I used a couple of sand containers on which to rest the base of the tree so it would be elevated exactly where I wanted it. From this stage I could build what would be the tree's roots out from the base, without having to worry about the base being supported in mid air because of the sand containers. You could use a coffee container or a couple of same size soup cans as well. Or you could just forget about creating the roots altogether; I wanted the base elevated to increase floor space, as well as increase the look. What I did for points of reference -was do a search on the net for pictures of trees, swamp trees and pics of bark. This potential Leopard gecko housing will need at least three layers of grout. I use the non-sanded grout -only because it's easier to thin. I generally use a grout mixture(with water) that has the consistency of thin pancake batter for the first two layers; and then a slightly thicker layer for the third coat. Even though your leopard gecko is not strong like an iguana these extra layers are still a good idea. Leopard geckos might not be strong but you are! You can easily have an accident and wind up damaging your tree. The color of the first two layers of grout could be anything, seeing as how you're only going to cover them up with the third layer. For the third layer, I colored the non-sanded white grout I was using, with brown colored cement color (you can also use cheap acrylic paint, the cement color is just a lot stronger). This potential snake habitat also needs to be properly sealed. I used four layers of non-toxic acrylic sealant, making sure to cover every square inch. As the last layer of sealer was drying, I sprinkled non-toxic colored sand over the entire structure. This was obviously done to add some color and texture, its other benefit is to eliminate 95% of the glossy shine the sealant leaves behind. If this potential tree frog habitat interests you -be sure and check out the other structures on this site, they all have demonstrational videos. Be sure and watch the above video demonstrating the steps involved in building this Leopard gecko habitat/tarantula habitat/snake habitat/tree frog habitat/Vietnamese centipede habitat etc.